VPI Nomad review | What Hi-Fi? It must be quite a daunting task to name a new hi-fi product. So bizarre or tangential are so many of the titles, it often seems that manufacturers haven’t really bothered trying to come up with anything that relates to the product in question at all. But naming this one the Nomad makes sense. Although we concede that it's highly unlikely that many nomadic tribes are actually interested in hi-fi, if they were, this turntable from VPI would appear to suit many of their demands. 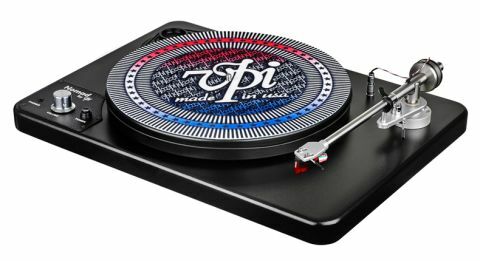 VPI, whose extensive history of designing quality premium turntables speaks for itself, calls this the first all-in-one, high-end entry-level turntable. Its built-in phono stage and headphone amp mean that all you need pair it with is some headphones or even desktop speakers. That fuss-free aspect extends to the set-up, which is no more complicated than adding the turntable platter and belt (there are separate grooves on the pulley for changing speed between 33 1/3 and 45 RPM), and removing the stylus guard. Its cartridge is the well-regarded Ortofon 2M Red, and is mounted on a nine-inch stainless steel tonearm. The plinth is vinyl-covered MDF, there's nothing particularly flash here. Despite the not inconsiderable pricetag, we have some concerns regarding the Nomad’s build. Though we are particularly impressed by the quality of the oil-bath bearing when dropping on the platter, we are disappointed by the platter itself – specifically, it isn’t flat. When it begins spinning, it appears to wobble immediately. Placing a finger beneath the spinning plate highlights quite a major discrepancy. How much this affects the Nomad’s performance is difficult to determine. Perhaps it's so minimal that, sonically, it could barely be an issue at all – nonetheless, it is indicative of poor quality control. Though it affects only the platter, you would want to cast a critical eye over the Nomad if you were to pick one up. Having connected the Nomad to our reference system, we first play Shostakovich’s Symphony No. 1 in F Minor, as performed the Moscow Philharmonic Orchestra, conducted by Kiril Kondrashin. Before we begin, it’s worth reminding ourselves that this is not an £800 turntable as such; its built in amp and phono stage leave us, for comparison’s sake, probably somewhere around £500. Still, the sound is upbeat and nicely textured. Brass and string sections converse with balmy swells and spritely retorts in what is a suitably lively but easily listenable opening. Generally speaking, it is a well-balanced presentation. There is no harshness as strings stab, nor is there a rolling-off in the treble. Though we aren’t hearing wall-trembling levels of low end, the sound is nicely weighted with enough bass to give support to what can be a pleasantly tender midrange. While not attempting to accentuate it unduly, the Nomad fully subscribes to analogue warmth. There is a good amount of detail, as well; individual instruments sound authentic and are easily distinguishable, with well-defined timbre – vibrato and glissandos are prominent and aid expression well. This isn’t the most analytical level of detail we’ve heard, but is abundant enough to draft a clear and engaging portrait of the piece. And of dynamics, we can hardly be disappointed by the rumble and boom of the timpani or the shrieks of chopping strings. The Nomad is more than comfortable with those large-scale shifts. There is room for improvement when it comes to subtler dynamics; those often minimal but ultimately expressive peaks and dips in force that give each part its personality. There is enough there to hold our attention – it’s ultimately enjoyable ­– but we aren’t completely absorbed as we would be if the sound were a little more sensitive to those elements. The only other thing we’d like a bit more of in the mix is space. It isn’t that the sound is overly compressed, but it can sometimes be difficult to separate instruments when textures build in one frequency band. Changing tack somewhat with The Twilight Sad’s Nobody Wants To Be Here And Nobody Wants To Leave, we notice this more. With crunching guitars often doused with a healthy amount of reverb, we get a warm wash of sound but one that can become rather one-dimensional. We don’t want our music to be clinical – this feels to us like a turntable built on musicality rather than analysis – but we would welcome just a little more insight. James Graham’s vocal could also be more expressive – a symptom of that marginal lack of subtle dynamics – but otherwise we like the sound. There’s enough transparency here to be able to discern the change in recording and production from live orchestra to studio album, but that same warmth and satisfying balance is present. We’re pleased to say the same is also true when we plug in a pair of headphones. Of course, we can’t expect exactly the same performance as when using our reference amplifier and floorstanding speakers, but the general character of the sound is pretty uniform anyway. So let’s be clear: we were going to award the Nomad four stars. It isn’t truly exceptional, but does most things either well or very well for the money. And that’s before you even consider its versatility, sonically this is very much a recommendable product. However, that issue with the quality control has cost the Nomad a fourth star. Our review sample arrived with a poorly machined turntable platter, and we can’t be entirely confident that there won’t be similar pressing issues with other units. If that no longer becomes a problem, we would absolutely consider revising this three-star rating. If the Nomad fits your budget and your priorities, we recommend you go and check one out for yourself. They’re right, as far as we’re concerned, about this being an anomaly in terms of high-end, all-in-one turntables, and it wouldn’t be only a lack of alternatives that would lead you to taking one home or, for that matter, away.